Studying business opens up so many opportunities, says AUT business alumnus Kitaen Salt who now works at Wells Fargo Securities in London. Choosing where to study was easy, says Kitaen. Take advantage of every opportunity AUT offers, Kitaen advises other students. 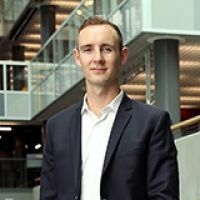 These opportunities included being co-president of the AUT Investment Club, sitting on the board for the American Chamber of Commerce in New Zealand, competing in the CFA Equity Research Challenge, as well as completing valuable workplace experience at PwC New Zealand. After graduating at the end of 2016, Kitaen went to New York through the AUT Internz International Scholarship Programme, which enables AUT graduates to immerse themselves in a new market and culture. “Securing an internship within National Australia Bank’s Global Institutional Banking division in New York was a life-changing opportunity, both professionally and personally. The experience was unparalleled, and helped me to gain an international perspective that is vital in today’s truly global business environment.